Operating hours of train services and selected bus services will be extended on the eve of Chinese New Year 2019, Monday, 04 February 2019, for the benefit of late-night commuters. Last train timings along all MRT and LRT lines will be extended to the early hours of 05 February 2019, along with selected residential bus services that allow commuters to connect from the last train. In addition, several evening peak Bus Services will have their operating hours changed to early afternoon. Bus Service Diversions will be taking place from 5.00pm onward on 04 February 2019, for the Chinatown Chinese New Year 2019 (Countdown). Train services will be extended, and LRT services will depart after the last MRT service, allowing passengers to connect from the last MRT train. Do note that there is no extension of train service for Bukit Panjang LRT Line. ** – Due to the daily early closure of the Bukit Panjang LRT for planned renewal works, there will be no extension of train service for Bukit Panjang LRT Line. 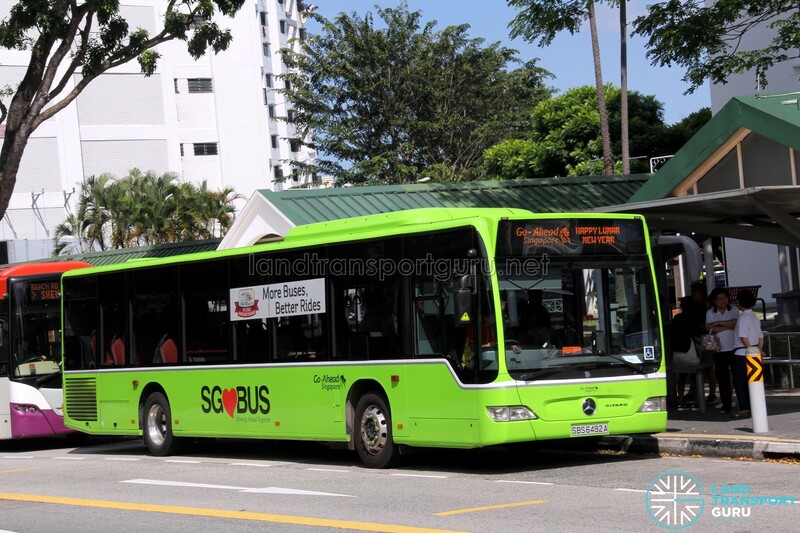 Operating hours for residential bus services will be extended instead. The operating hours of selected residential bus services to complement extended train operating hours. Feeder services that call at the interchange twice in a single trip (including Feeder 812) will have their last buses perform one of each loop, departing the interchange at the same time. (e.g. Feeder 359 East and West loops departing Pasir Ris at 1.10am and performing one loop only). These buses will have the T Suffix (e.g. Service 307T, 291T, 359T, 812T, 911T). 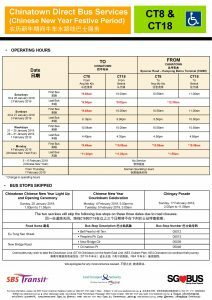 In addition, Chinatown Direct Bus Services CT8 & CT18 will have their operating hours extended further, with their last buses departing Kampong Bahru Bus Terminal at 1:55am. There will be no extension to SBS Transit Nite Owl and SMRT Buses NightRider services. Their last trips will continue to be operated at 2.00am. Do note that NightRider NR7 is not in operation. For a travel guide to Nite Owl and NightRider services, click here. SMRT NightRider NR7 is suspended till 15 June 2019 to facilitate the Night On-Demand Public Bus (CBD to Bedok & Tampines) Trial. Evening Trip operating hours for selected Peak Hour bus services will be brought forward to the early afternoon on Chinese New Year’s Eve, Monday, 04 February 2019. In addition, several selected bus services will also have their operating hours adjusted. These services continue to operate their morning peak trips as usual. However, there would be no operation during the evening hours as the trips are brought forward to early afternoon.